A while back I flirted with the gluten free range of products in my local supermarket to mixed success. While there were some genuinely nice and new experiences none of them were totally invisibly gluten free. This however is different. 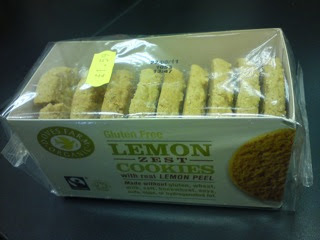 I picked these up from Red Kite Health Foods just because they were biscuits, no review or special angle in mind. I had to double check the package to make sure that they were indeed gluten free and when I tested them on my fiance she couldn't identify why they were 'special'. They are more snappy than normal biscuits and not as crumbly which some people may not enjoy, but the crunch is quite nice. The lemon flavour tastes authentic and really zingy and makes these a little overpowering for with tea so a couple as a snack is my recommendation. I'm not sure how prolific this brand is, but it's another reason to go diving into your local health food shop - it's not all potions and remedies these days!